In case you didn’t know, Rez HD is out on Xbox Live Arcade now for 800 points. It’s basically the same game as the Dreamcast and PS2 versions, but with HD graphics, 5.1 sound and all the expected online leaderboards gubbins. Buy it if you haven’t already. Yesterday’s download was the first time I’ve played the game in a couple of years – pretty much since I bought a bargain copy in Japan in 2005 – and it’s even more of a trippy assault on the senses than it was then. If you have an HDTV and a 5.1 system I consider it to be a must-buy, in a similar way to how Geometry Wars became an unlikely early poster child for HD gaming. I’m so glad that stuff like this is getting a new lease of life in downloadable form, without the limited print runs that marred its retail performance on release. Ignoring the inexplicable oversight to make the game default to stereo sound (go into the settings and set it to 5.1 if you haven’t), essentially turning off one of the game’s main selling points, I spent a couple of hours playing the first couple of stages. It’s the ultimate chillout game – even against similar ideas like flOw or Electroplankton – that you can just sit back with and only worry about a stick and a couple of buttons while it plays some great music for you. I love it, and consequently was listening to the Rez soundtrack at work for most of the day today. Given that Rez HD also supports using controllers as up to three trance vibrators, much to the presumable delight of Jane Pinckard, unless you’re desperate to have the game on your shelf as part of the collection there’s no reason to bother with the disc-based editions. This one costs £6.80 – that’s SIX POUNDS EIGHTY PENCE, or roughly 1/7th of the recent going price for a Dreamcast copy on eBay – and even has the original 4:3 standard definition version in there for the luddites. Just try to make an excuse not to buy it. Anyone who downloaded the iTunes 7.5 last week probably noticed something in the change list about a new game called Phase. It’s now out on the iTunes Store (link), priced at £3.99, and it’s a rhythm game from Harmonix. Yes, that Harmonix. And yes, it’s an iPod game. It’s basically Amplitude in miniature, and it’s made all the more impressive by the fact that it allows you to import your own music. Hopefully this is an indication of where we’ll be going with the next Rock Band – or the next Amplitude? – because if an iPod can do that analysis of a song (actually it’s iTunes that does the analysis, but let’s not be so pedantic that I ruin my point) there’s certainly no reason that a modern console can’t do it. 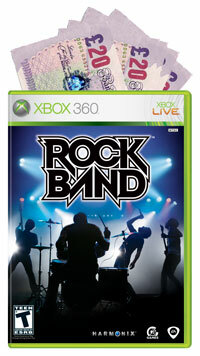 It’s probably the only possible feature that would make me entertain paying £170 for Rock Band. The quality of the experience really depends on the music – dance music and anything with a prominent, repeating rhythm works well; more subtle music not so much – but when it works well it works very well and what it could represent for the future of Harmonix’s rhythm games is very exciting. I just hope that the implementation of mass DLC in Rock Band doesn’t cause dollar signs to blind them to the potential of importing one’s music collection manually. 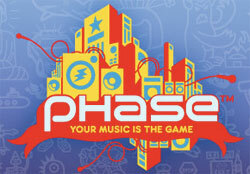 Phase isn’t as good as Guitar Hero or Amplitude, but on this showing I see potential in bespoke iPod games that the ever-nascent mobile phone gaming market continually fails to fulfill. And Guitar Hero and Amplitude, least of all Rock Band, aren’t £3.99, are they? I haven’t had a chance to listen to most of it since it’s five discs, 218 tracks, and over five and a half hours long. I think that I actually have albums that are quicker to listen to straight through than it’s been to import this thing into iTunes. 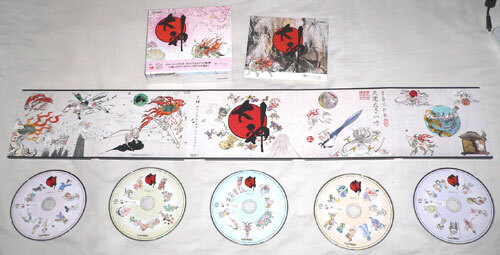 The music while playing the game has been very good, obviously with strong traditional Japanese influences and more modern elements for good measure. If you like that kind of music I’m sure you’ll enjoy it. In any case how can you say no when it’s this purdy? Anything less wouldn’t do the beauty of the game justice, I suppose.